Time is one of our most precious but limited resources. According to world-class speaker, productivity expert, and bestselling author, Brian Tracy, the quality of your life actually depends on the quality of your time management, and "...time management is really personal management, life management" Tracy says. "If you don't control your time properly, it is difficult for you to control anything else." Many people, unfortunately, fall short on this by living in a "reactive-responsive" mode. As the name suggests, these people default to merely reacting and responding to external stimuli, often without stopping or thinking first. What they do with their time, therefore, becomes less within their control, and this makes them unintentional, unproductive, and ultimately, unfulfilled. While all of these categories are extremely important, I'll only be focusing on three within this post. 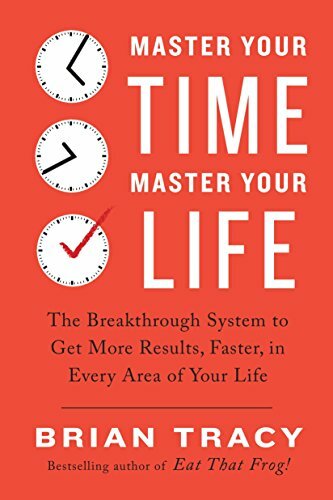 Here are my 3 Takeaways from Master Your Time, Master Your Life: The Breakthrough System to Get More Results, Faster, in Every Area of Your Life. One of the best ways to make the most of time is to set clear goals and do actions that lead to those goals. This requires you to make sure that everything you do has a purpose attached to it, and that purpose is indeed what you want. Otherwise, you'd be spending time on things that don't matter and don't contribute to living the life that you choose. Specifically, you can do this by deciding what it is that you want exactly, writing it down, setting a clear deadline, making a list of everything you can do, organize the list by sequence, and taking action by doing something everyday that moves you towards your goal. The author explains that you're acting intelligently if you’re moving towards your goals but it's important to also highlight the opposite: you are not acting intelligently if you're moving away from your goals. What have I been hired to accomplish? Which activities can I turn into habits in order to double or triple my productivity? If I could only do one task on my to-do list all day long, which one activity would contribute the greatest value to my work and to my company? While the last question is actually related to Tracy's previous book from 2001 called, Eat That Frog!, it's still as relevant (if not more) as it was back then. Being productive during work time is simple: actually work when you work. Now, this is more difficult to put into practice than you'd expect because you are constantly "...surrounded by people and situations that waste your time and undermine your effectiveness all day long," Tracy says. "Only by practicing rigorous self-discipline can you free yourself from these thieves of time." Telephone, email, and text - As much as possible, filter or screen your emails (or have an assistant do so), don’t answer unknown numbers, batch your calls and emails, or simply get back to the person/s at a later time. In cases that you can't avoid being interrupted, however, try to just make it fast. Unexpected visitors - First, set boundaries by clarifying when you aren't to be disturbed. Second, when someone pops in your office, stand up as if you’re about to leave, or when someone calls, answer the call as if you’re about to go somewhere to indicate to them that they must get straight to the point. Third, open your schedule for specific blocks of time wherein others can meet with you. Fourth, you can also bring a discussion to a close by saying “one more thing before you go,” and fifth, make sure to reciprocate the relationship by not wasting or interrupting others' work time as well. Meetings - When it comes to meetings, it's critical to always have an agenda, set specific start and stop times, and cover topics in order of importance and urgency. Make sure everyone present in the meeting actually needs to be involved and what each person's contribution or task is coming out of it. Tracy also suggests you add up each person’s hourly salary in order to know how much the meeting is really costing you, and then calculating the ROI (return on investment) of whatever the meeting accomplishes after. Remember, what you choose not to do is sometimes just as important as what you choose to do so make sure to limit or avoid time-wasters as much as possible. According to Tracy, "The most valuable and important thing you do is think." Instead of merely reacting and responding to whatever event, opportunity, or problem that comes your way at whatever time of the day, pause and assess the situation first. Identify which category of priority is required of you in that moment, then think and act accordingly. Remember, quality thinking leads to a quality life. Master Your Time, Master Your Life is a quick, easy-to-read book that breaks down how to manage and make the most of your time. This is for you if you want timeless and straightforward tips written in Tracy's signature approachable writing style, as well as actionable steps at the end of every chapter. Share in the comments below: What did you find most useful from this article/book? Which category of priority are you using the most? Which do you need to improve on?